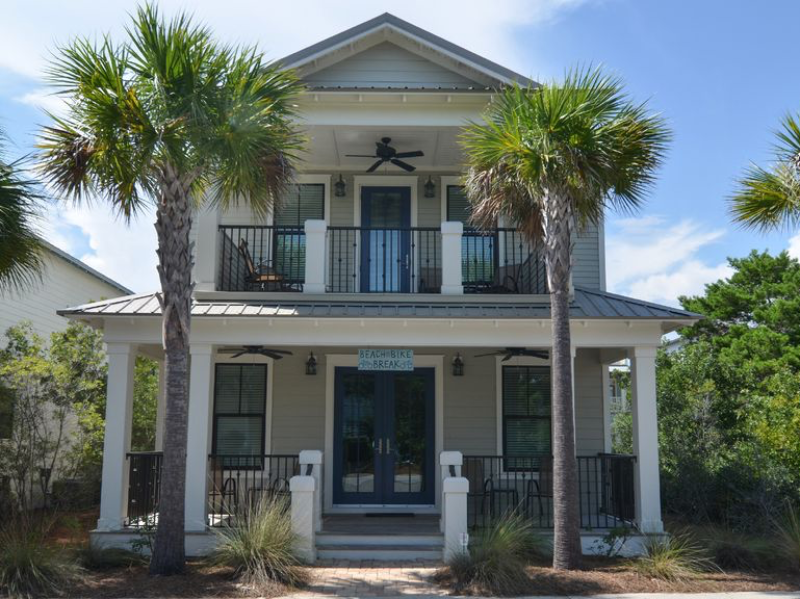 Brand new to the vacation rental market – discover Beach Bike Break, a four bedroom, three and a half bathroom home that comfortably sleeps eight and is nestled amid natural vegetation and swaying palm trees in picturesque Seacrest Beach — one of the premier communities along Scenic Highway 30A. The open concept living space on the first floor features plush, comfortable furnishings that are beautifully harmonious. There is ample room for your family to be together and regale each other with tales of the beach whether you’re preparing a meal, sitting down in the dining area, or relaxing in front of the television. When easing into your morning or winding down for the day, taking a break on the front porch is a fantastic way to savor the salt air and enjoy the natural serenity of the resort community. Inside, the kitchen presents the perfect opportunity to indulge your inner chef, take a break from the every day and have a little culinary adventure. With its richly hued cabinetry, granite counter tops and stainless steel appliances, this kitchen features everything you need to prepare a scrumptious meal or a quick snack. Pull up a chair at the breakfast bar and sip on a fresh-brewed cup of coffee or tea while you enjoy a delectable pastry from the the renowned Charlie’s Donut Truck. Or gather your family around the dining table and share a meal as you plan the exciting day you will have at the world’s most beautiful beaches. At the end of the day, sit back and relax in the comfort of the family room which is particularly well-equipped for evening entertainment, with immersive surround sound system, Blu-Player and a large flat panel High Definition Smart TV with available Netflix. When you are ready to recharge your batteries, the home features superb accommodations to comfortably sleep eight guests in beds. The master on the first floor is situated near the rear of the home, has a dual vanity ensuite bathroom, and plush bedding ensuring a tranquil and restful night sleep. On the second floor, you’ll find another deluxe master bedroom which features a sitting area, private access to the second story porch and a king bed that virtually guarantees a heavenly night sleep. The ensuite bathroom features dual vanities, garden tub, private water closet and a frameless glass encased stand-up shower. The second floor also features two exquisitely appointed queen bedrooms that share a jack and jill bathroom and offer enchanting, private spaces for relaxation and rest. All bedrooms are outfitted with state of the art, flat panel, high definition televisions. Free WiFi is available throughout the home. This 2,360 square-foot beach rental is the perfect place to enjoy a memorable vacation with family and friends! For the more actively inclined, tennis, golf, water sports, walks, and bicycle excursions are just some of the activities you can try nearby. Relax and unwind in paradise. You’re home!